12-Pack, Golf Balls; 6 Emoji Designs; Funny Gag Gifts For Him; Birthday Gifts For Dad; Perfect Gifts For Dad. 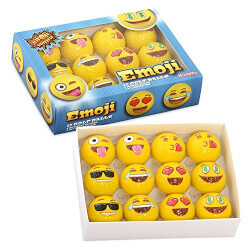 12 Yellow Emoji Golf Balls In A Gift Box; Perfect Golf Gift; Best In Golf Gifts; Fun Gag Gifts. Two Of Each Design; 2 Tears of Joy; 2 Heart Eyes;2 Kissy Face; 2 Tongue; 2 Money Eyes; 2 Sunglasses. Perfect For Golf Practice Or Miniature Golf Balls; Will Not Ruin Your Golf Clubs! Great Grandpa Gifts. Golf Balls Make Great Golf Gifts And Are 2-Ply Professional Practice Golf Balls; Also Great Golf Gag Gifts.